Screening. 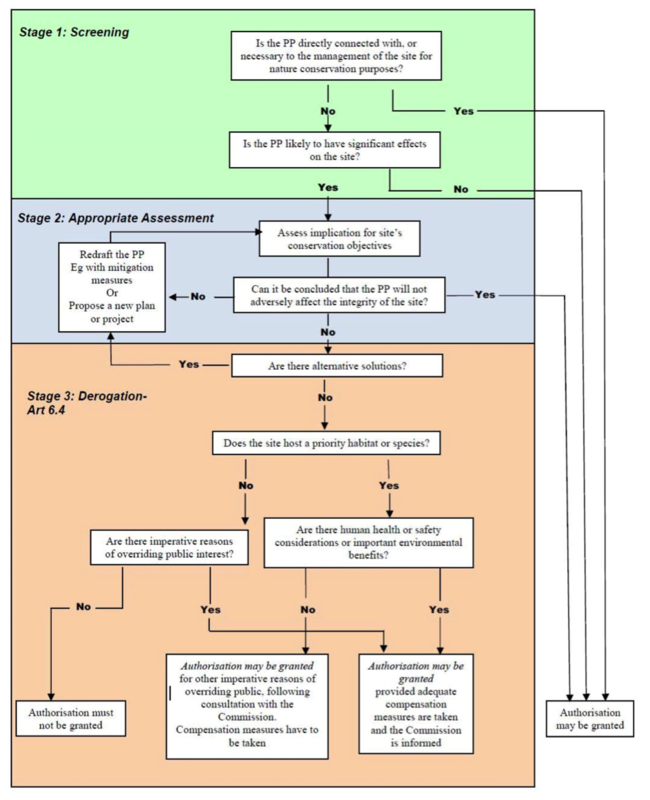 The first stage aims to determine whether an Appropriate Assessment is needed or not. This stage requires the collection of data and information about the considered aquaculture plan or project as well as the Natura 2000 site. Subsequently, it requires determining if the aquaculture plan or project is likely to have a significant effect and assess the risk of potential cumulative effects with other plans and projects. Appropriate Assessment. This stage of the procedure focuses on the Appropriate Assessment, with the purpose of assessing the implications of the plan or project in relation to the site’s conservation objectives. This stage includes the analysis of cumulative effects and, if needed, the identification of suitable mitigation measures necessary for minimising or even cancelling them in case of impacts. Derogation procedure under Article 6.4. The requirements of Article 6(4) of the Habitats Directive establish a set of conditions according to which the competent authority can authorise, by way of derogation, a plan or project even in case the appropriate assessment cannot demonstrate that the integrity of the Natura 2000 site concerned will not be adversely affected by it. The fulfilment of these conditions is subject to strict evaluation and is only allowed in exceptional circumstances. These conditions relate to the absence of alternatives, the presence of imperative reasons of overriding public interest and the adoption of all necessary compensatory measures.